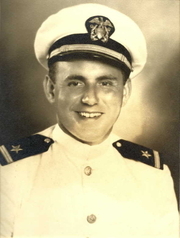 Leroy Hayman in World War II, commissioning photograph. I am Edward Hayman. LeRoy Hayman was my father. He was in his way a most heroic man. In 1953 - only 2 weeks before my birth - he was struck in the head by an ink bottle carelessly thrown by a disburbed boy from the 6th floor window of the YMCA in downtown Chicago. Miraculously, he survived, but thereafter was mostly paralyzed for the rest of his life. Thereafter he became an editor (first of his own magazine, "Background," then later the editor of Junior Scholastic Magazine) and author of numerous books for the juvenile market. He was a quiet and introverted person, yet at the same time he was warm and most sensitive. He bought good stocks and bonds and held them for years. He could quote Shakespear and the great poets at length. He taught me coin tricks, and the pleasure of sitting on a porch in the summer and sharing sardines and onions. I only fully appreciated him during the last years of his life. Leroy Hayman is currently considered a "single author." If one or more works are by a distinct, homonymous authors, go ahead and split the author. Leroy Hayman is composed of 3 names. You can examine and separate out names.